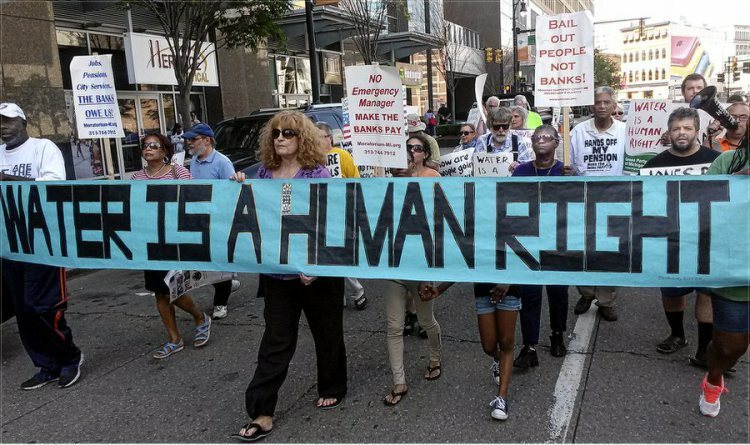 We call on activists everywhere to come to Detroit on Friday, July 18 for a rally and march to fight the dictatorship of Emergency Manager Kevyn Orr, appointed by millionaire Republican Governor Rick Synder, and backed by Wall Street bankers and the 1%. Taking place during the national Netroots Nation 2014 conference, several thousand people will converge in downtown Detroit to demand an immediate stop to residential water shutoffs and and an immediate restoration of water service. Demonstrators will demand that that the be no cuts to pensions and a restoration of retiree health benefits. Under a state-imposed bankruptcy, the City of Detroit workers face severe cuts to their pensions and tens of thousands of people face water shutoffs. The banks who have destroyed Detroit’s neighborhoods through racist predatory subprime mortgages and saddled the City of Detroit with fraudulent subprime financing, continue to loot the people of Detroit. Detroiters have lost their democratic rights – “elected” officials serve at the pleasure of the unelected Emergency Manager, and may be fired at any time. From the loss of the auto plant jobs, loss of people from home foreclosures, attack on pensions, high insurance, replacing public schools with charter schools/Education Achievement Authority (EAA), water shut-offs, to privatization and the state helping corporations take over city assets and services such as Belle Isle, the largest urban park in the U.S., garbage department, workforce development, human services, health dept., Detroit Institute of Arts, with selling the water dept. on the horizon! Banks, billionaires and corporations made this bankruptcy up to rob the people of Detroit blind and kill democracy. Let’s come together to stop the takeover of Detroit, we are not going to take this anymore! United we can stop the takeover of our Detroit! Make the banks pay!